On July 2, the fantastic e-zine Americana-UK, the UK home of Americana music, honored me by publishing an interview with Rudie Humphrey. Who could wish for a better start of the summer? A summer spent rehearsing my new and old songs with a trio! I already played some shows with Jeewee Donkers on guitar, mandolin and lap steel. Now, JD Dekker, my companion in The Understate Men, has joined us on bass. Our debut will be on October 8 at De Bunker in Gemert. There will be a mystery guest involved and a new version of my old song "Who the Hell is Dow Jones" that suddenly gained relevance in the current fuss about refugees. After a refreshing vacation in the South of France, I am really eager to play. 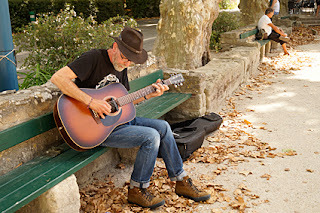 Especially after visiting Goudargues on this trip, the lovely French town where I played the Goud'acoustic Festival in 2008 and where I return once in a while to have a good meal, enjoy the atmosphere, visit some friends and play some songs. I hope to see you at one of my shows.